LANSING — Attorney General Bill Schuette, a Republican from Midland, hasn’t launched a campaign for governor yet. But he is the state’s top law enforcement officer and he’s currently drawing more campaign contributions than anyone else in state government. 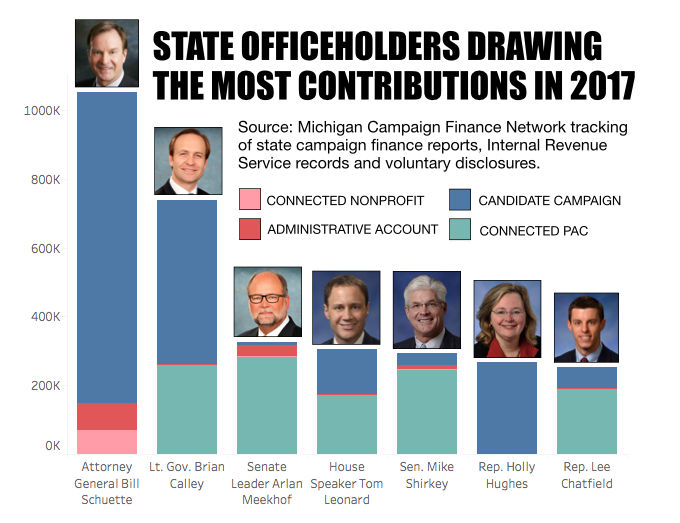 According to a new analysis of campaign finance disclosures, Internal Revenue Service (IRS) documents and voluntary fundraising reports, committees connected to Schuette have raised more money so far in 2017 than committees connected to any other elected official currently serving at the state level. And state officials are raising a lot of money. 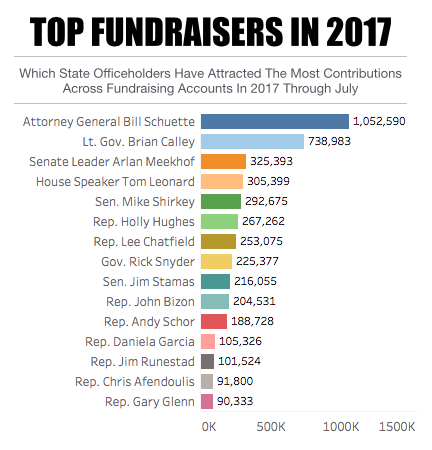 The top 15 fundraisers serving in state government have combined to attract more than $4.4 million in contributions over the first seven months of 2017. Most of the money has gone to officials’ candidate committees, which collect funds for their own campaigns for offices. But the officials are also receiving money for political action committees (PACs), which help fund other campaigns, for nonprofit organizations and for administrative accounts. Nonprofits and administrative accounts usually don’t directly fund campaign work. But they can pay for travel, conferences, event sponsorships, legal services and other administrative costs. Unlike candidate committees, leadership PACs, nonprofits and administrative accounts can accept unlimited contributions from donors. For example, the Bill Schuette Administrative Account, which discloses its donors to the IRS, reported on Monday raising $77,350 over the first seven months of the year. It received $20,000 from Walmart on May 5 and $25,000 from J.C. Huizenga, founder of National Heritage Academies, on June 5, according to the filing. Schuette’s nonprofit, On Duty for Michigan, has raised $70,000 in 2017, according to its voluntary disclosures. His candidate committee, Bill Schuette for Michigan, has raised $905,240 in 2017. After Schuette on the list of top fundraisers so far this year are Lt. Gov. Brian Calley, a Republican from Portland, Senate Majority Leader Arlan Meekhof, a Republican from West Olive, and House Speaker Tom Leonard, a Republican from DeWitt. Meekhof and Leonard control the agenda in the Senate and House respectively. Committees connected to each have received more than $300,000 in contributions so far this year. Of the 15 officeholders receiving the most money to their connected committees and organizations, 14 are Republicans. Republicans hold the governor’s office and majorities in the House and the Senate. The only Democrat on the list is Rep. Andy Schor, of Lansing, who is raising money for his campaign for mayor of Lansing. The primary election in his mayoral race is this month. The following is a summary of which officials' committees have been attracting the most contributions so far this year and where the largest contributions have been coming from. The numbers cover a period ending on July 20 for candidate committees and PACs and a period through the end of July for administrative accounts. Transfers from one committee or organization controlled by the official to another committee controlled by the same official are specifically not included in this tally. These numbers are likely not complete because many of these officials raise money through other organizations that don’t report their contributors to the public and that only report their fundraising totals on an annual basis. 14. Rep. Chris Afendoulis, Republican from Grand Rapids Twp.